Much of Southern cooking originated as poor people's food, but now it is not only considered respectable cuisine but is also celebrated around the world. Biscuits and sausage gravy originated as survival food that was easily accessible since wild pigs were plentiful while milk and flour were cheap in the deep South. This quick breakfast can be served alone or as part of a big country-style breakfast. No matter how you serve this traditional Southern favorite, it is a great way to start any morning. Whisk together 3 cups of the milk, the flour, and salt and pepper to taste until flour is dissolved. Pour into a skillet over medium-low heat. Simmer, stirring constantly, for 15 minutes. In a separate skillet, brown the sausage, stirring and breaking up the meat until cooked through about 8 to 10 minutes. Crumble the sausage and drain the excess fat. Stir crumbled sausage into the gravy and keep warm. Mix biscuit mix with remaining 3/4 cup milk in a bowl until soft dough forms. Drop the dough by spoonfuls onto an ungreased baking sheet. Bake biscuits for 10 minutes, or until nicely browned. Ladle hot sausage gravy over split biscuits. Serve warm. Since its humble beginnings, biscuits and gravy has been a simple recipe, but there are many different ways to cook this Southern dish now—you can add onions while cooking the breakfast sausage for a more savory taste; you can also spice it up with cayenne pepper, crushed red pepper, or cracked black pepper. Another way you can put a twist on the traditional biscuits and sausage gravy is by making it gluten-free. You'd simply use gluten-free all-purpose baking flour in place of regular flour. Those who forego pork can use turkey breakfast sausage instead. Vegetarians need only to switch the pork sausage for the vegetarian sausage to enjoy. If you want to make it vegan, replace the regular milk with almond milk, and make a mushroom gravy to give the dish a texture boost. If you are looking to make serving easier, make it into a casserole. Bake half of the biscuits in a casserole at 400 F for 10 minutes and pour the finished gravy over the top of the finished biscuits. Add the uncooked biscuits on top and bake for 15 to 20 minutes until the biscuits are golden brown. Now you can serve your biscuits and gravy in one step. 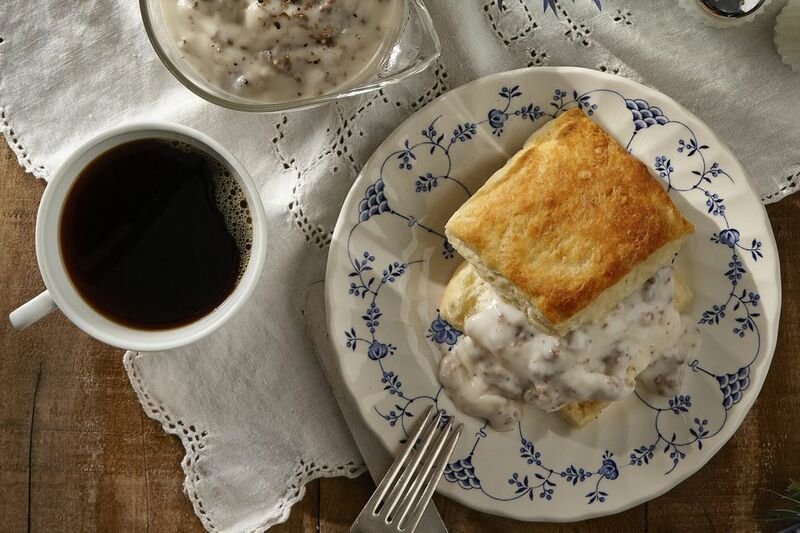 There are plenty of ways to add a twist to the traditional biscuits and sausage gravy recipe. Make your biscuits cheesy with a cheddar biscuits recipe, and instead of sausage gravy, make it a tomato gravy. This will remind you of grilled cheese and tomato soup, but be so much more satisfying with the added Southern kick.